The Opioid Epidemic is a wicked problem! Prescribing has reduced but overdoses have increased. There were 64,000 overdose deaths in 2016 and one estimate suggests 650,000 expected deaths over the next decade. So which next steps are most likely to be effective for communities to treat this national epidemic? 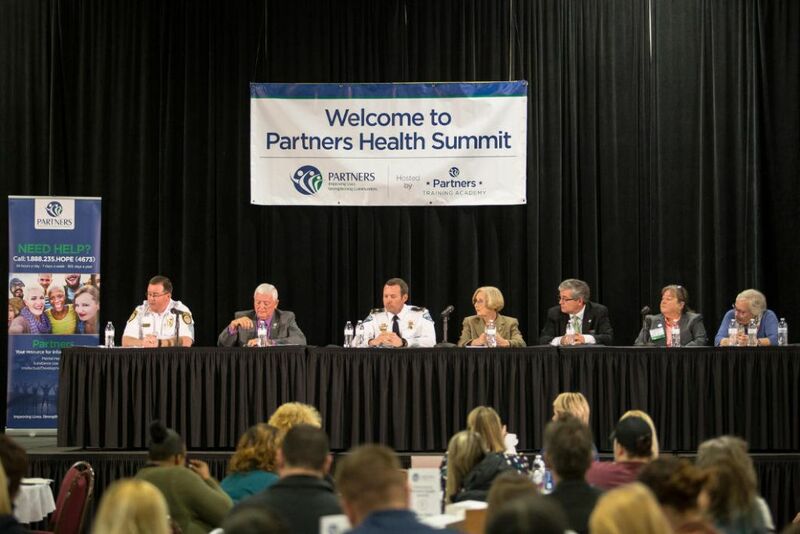 Last Friday, April 6, 2018, Partners hosted Partners Health Summit: Treating the Opioid Crisis, its third summit focusing on opioid abuse and addiction. 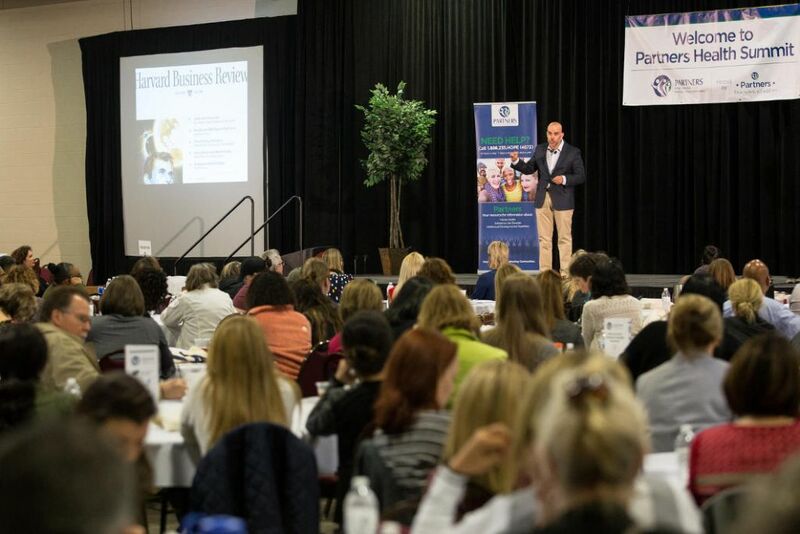 Leading the conversation was keynote speaker Dr. Omar Manejwala, M.D., an addiction psychiatrist, international speaker, former Hazelden Foundation Medical Director, and bestselling author of the book, Craving: Why We Can’t Seem to Get Enough. Doctor Manejwala is Chief Medical Officer of an LA-based national health services management company. He has over 15 years of experience treating addictive disorders, has treated thousands of patients with addictions from all walks of life, and is widely regarded as one of the nation’s leading experts on addiction. This free conference was jointly sponsored by Partners Behavioral Health Management, and Charlotte Area Health Education Center (AHEC). For more materials from this summit and previous summits, and for regular updates concerning our next summit, please visit https://partnerstraining.com/partners-health-summits/. If you have used services through Partners in the past 12 months, or if you are the guardian of someone who has, you will get a letter in the mail at the end of April 2018. Partners will send about 40,000 letters to people, or guardians of those people, who have used services through Partners from April 1, 2017 to March 31, 2018. In this letter, you will find information about Medicaid and state-funded services for mental health, intellectual and developmental disabilities, and substance use disorders. You will also receive a copy of our Notice of Privacy Practices. This document tells you what you need to know about your protected health information, and how you and Partners can keep your information private. This annual mailing is required by the NC Division of Medical Assistance. The mailing simply reminds individuals to contact Partners for any behavioral health resources. In the letter, we emphasize our focus on individuals’ rights and privacy. We also want people to know Partners is always available to help you in a crisis, find providers and services, or schedule enrollee education. More information, such as your rights and responsibilities, and procedures for obtaining benefits, can be found on our website at www.PartnersBHM.org. If you or someone you know is experiencing a behavioral health crisis, or if you have questions, call our Access to Care department anytime, every day, at 1-888-235-HOPE (4673). At least once a year, Partners will send a letter reminding you of your privacy rights, where you can find information, and how to contact Partners. Sometimes we want to tell you about important changes to your services or events you will find very helpful. Although we may only mail letters to you a couple of times a year, it is important you receive them. If you have Medicaid – Contact the Department of Social Services for the county approving your Medicaid. You can find the list online or in your Consumer/Enrollee Handbook. If you have concerns about receiving mail from Partners, talk to us at 1-888-235-HOPE (4673),or talk to your care coordinator, your provider, or your local Department of Social Services. Hickory Brain Injury Support Group will have a social bowling outing for April’s meeting on Tuesday, April 24, 2018, at 6 p.m., at AMF Colonial Lanes, 1951 US Hwy 70 SE, Hickory, NC. Survivors can bring a guest and have shoes and two rounds of bowling paid for by support group funds. To RSVP, or for more information, contact Travis Glass at 828-781-0778 or travis@crossroadscounseling.org. Also check them out on facebook.com/HickoryBISG. Family Fest, sponsored by the Iredell County Adult and Children’s Collaborative, is a celebration of learning and health! This year’s event will be held Saturday, April 28, 2018, from 10 a.m.-1 p.m., at Fairview Baptist Church, 349 Turnersburg Highway, Statesville, NC. Family Fest is a celebration of learning, health and our community! The goal is to provide a day to bring families and the community together and to raise awareness of the services and activities available in Iredell County. There will be over 30 vendors, local performers, a DJ, bounce houses, giveaways, food trucks, and more. Individuals living with Intellectual Developmental Disabilities and their guests are invited to dance the night away at the Spring Fling Dance on Saturday, May 5, 2018, from 7-10 p.m., at Bethel Presbyterian Church, 19920 Bethel Church Rd. Cornelius, NC. Enjoy a night out featuring music, dancing, and light refreshments. The dance is free for ages 16 or older. Please sign up online at www.bethel-pc.org. Go to “Events” and click link below ‘Spring Fling flyer’ to register. For more information, contact Lisa Hunter at 704-491-7869 or lisarenehunter@gmail.com. You are invited to spend “an evening in the stacks,” at a benefit to help our citizens with intellectual disabilities. The gala is on Saturday, May 12, 2018, from 6-11 p.m., at the Gastonia Conference Center, 145 Dr. Martin Luther King Jr. Way, Gastonia, NC. To purchase tickets, contact The Arc at 704-861-1036 or www.gastoncountyarc.org. Attend the film and a Q&A and discussion on Tuesday, May 1, 2018, at 7:30 p.m. or Thursday, May 10, 2018, at 7:30 p.m., at AMC CLASSIC Shelby 10, 2002 E. Dixon Blvd., Shelby, NC. The film chronicles the story of Kevin Hines, who at age 19 attempted to take his life by jumping from the Golden Gate Bridge. Since then, Kevin has been on a mission to use his story to help others stay alive and find recovery. Tickets are free, but quantities are limited and must be reserved. Please contact Melodie McSwain at mha@clevelandcountymha.org or 704‐481‐8637 to reserve tickets. Find out more at www.SuicideTheRippleEffect.com.